The Los Angeles Food Policy Council (LAFPC), in partnership with the East Los Angeles Community Corporation (ELACC), Leadership for Urban Renewal Network (LURN) and Public Counsel, has won the highly-coveted LA2050 Activation Challenge, receiving a $200,000 grant to aid their work in engaging Angelenos around the rights of sidewalk vendors. “We are so excited and were pleasantly surprised!” said LAFPC Policy Associate Rosana Franco. The City of Los Angeles is one of the only major cities in the country that does not have a legal permit process to support the micro-entrepreneurs who sell food and merchandise on city sidewalks, leaving them vulnerable to harassment and equipment confiscation, Franco explained. With the LA2050 grant funds LAFPC will support the food handling component of the initiative, ELACC will continue outreach and organizing with sidewalk vendors, LURN will provide technical assistance and business development, and Public Counsel will provide legal support and analysis. 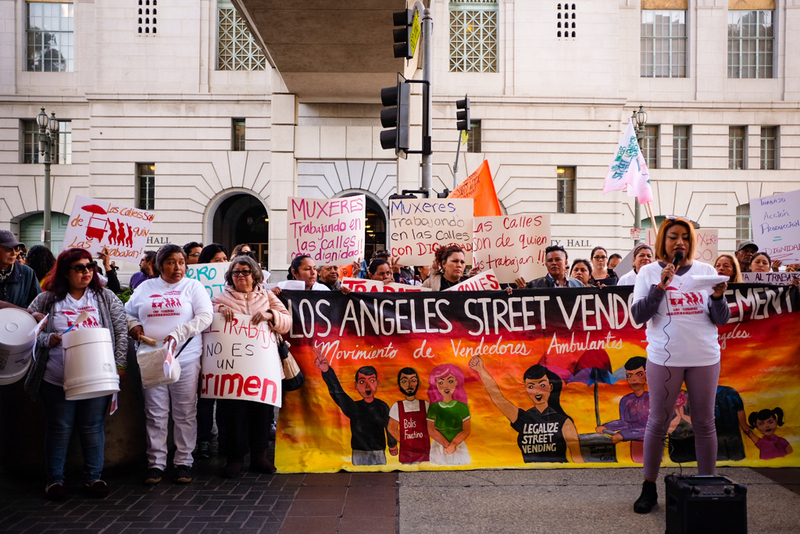 While their success has seemingly happened overnight, this victory is seven years in the making as the LA Food Policy Council has been an active member of the steering committee for the LA Street Vendor Campaign since its formation in 2011. “A draft of the sidewalk vending ordinance was released on July 2nd and hasn’t been approved by City Council -- yet. But it’s still a huge win!” said Franco. The partnership is hopeful that the ordinance will be approved by the council sometime this summer. In the meantime, the LA County Department of Public Health has expressed interest in collaborating with the LA Street Vendor Campaign to provide food-related training tailored to street vendors’ specific needs, such as the health permitting process.